The heart failure epidemic continues to rise with coronary artery disease as one of its main causes. Novel concepts for risk stratification to guide the referring cardiologist towards revascularization procedures are of significant value. 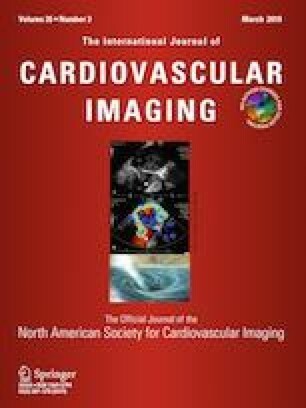 Myocardial perfusion imaging using single-photon emission computed tomography (SPECT) agents has demonstrated high accuracy for the detection of clinically relevant stenoses. With positron emission tomography (PET) becoming more widely available, mainly due to its diagnostic performance in oncology, perfusion imaging with that modality is more practical than in the past and overcomes existing limitations of SPECT MPI. Advantages of PET include more reliable quantification of absolute myocardial blood flow, the routine use of computed tomography for attenuation correction, a higher spatiotemporal resolution and a higher count sensitivity. Current PET radiotracers such as rubidium-82 (half-life, 76 s), oxygen-15 water (2 min) or nitrogen-13 ammonia (10 min) are labeled with radionuclides with very short half-lives, necessitating that stress imaging is performed under pharmacological vasodilator stress instead of exercise testing. However, with the introduction of novel 18F-labeled MPI PET radiotracers (half-life, 110 min), the intrinsic advantages of PET can be combined with exercise testing. Additional advantages of those radiotracers include, but are not limited to: potentially improved cost-effectiveness due to the use of pre-existing delivery systems and superior imaging qualities, mainly due to the shortest positron range among available PET MPI probes. In the present review, widely used PET MPI radiotracers will be reviewed and potential novel 18F-labeled perfusion radiotracers will be discussed. The online version of this article ( https://doi.org/10.1007/s10554-018-1469-z) contains supplementary material, which is available to authorized users. The heart failure (HF) epidemic continues to rise with an estimated future financial burden of $70 billion in the year 2030 [1, 2]. Notably, HF has been recently further subclassified into HF with reduced ejection fraction (HFrEF), with preserved ejection fraction (HFpEF), and an intermediate group (HF with mid-range ejection fraction, HFmrEF) [3, 4]. However, one of the main characteristics of either HFrEF, HFpEF or HFmrEF is coronary artery disease (CAD, in up to 54% of the cases) [3, 5, 6] and therefore, its reliable detection, preferably at an early stage of disease, is as relevant as ever . As a result of these considerations, novel strategies for the assessment of flow-limiting coronary artery stenoses have been extensively investigated and myocardial perfusion imaging (MPI) has been an important part of evaluating for this pathology. The most commonly used radiotracers for MPI are the single-photon emission computed tomography (SPECT) agents 99mTc-labeled sestamibi and tetrofosmin, as well as thallium-201 (201TI) . In general, the use of positron emission tomography (PET) is expanding worldwide, mainly due to its superior diagnostic performance in oncology [9, 10]. Thus, MPI may benefit from the increasing installed base of latter imaging modality, as PET may provide advantages over SPECT MPI imaging. First, PET has a higher spatiotemporal resolution in comparison to SPECT and a higher count sensitivity. In this light, several studies have already reported on the superior imaging characteristics and higher accuracy of PET MPI compared to conventional SPECT MPI [11, 12]. Moreover, PET includes attenuation correction on a routine basis, as hybrid systems equipped with computed tomography (CT) are routinely installed, which also allows for anatomic co-registration . Apart from that, with traditional PET agents, both rest and stress images can be acquired during one single study, mainly due to the shorter half-life of PET agents  and PET has also opened the door for reliable quantification of absolute myocardial blood flow (MBF) [15, 16]. Nonetheless, expensive production procedures with on-site cyclotrons are needed for short-half-life agents . This is in contradistinction to recent developments of novel 18F-labeled radiotracers, which may overcome some of the hurdles to adoption of established PET MPI agents. First, 18F-labeled imaging probes for MPI may be distributed using delivery systems from central cyclotron facilities. Second, the longer half-life of 18F-labeled MPI agents also allows for delayed imaging protocols. From a practical standpoint, exercise stress testing outside of the scanner is feasible . This manuscript reviews this novel class of PET radiotracers for MPI. Among those, 18F-flurpiridaz (also previously referred as 18F-BMS747158-02) and 18F-fluorobenzyltriphenyl-phosphonium (18F-FBnTP) have been extensively evaluated and thus, will be further discussed. To date, the clinically used PET MPI agents are rubidium 82 (82Rb, half-life, 76 s), oxygen-15-water (15O-water, half-life 2 min) and nitrogen-13-ammonia (13N-ammonia, half-life, 10 min) . For the production of 82Rb, a commercially available strontium 82 generator is needed, and the high cost for a monthly replacement ($20,000) is a consideration for practitioners as to what extent 82Rb PET MPI can be employed in clinical routine . Further drawbacks include its ultrashort half-life and the lowest first-pass extraction (65%) among all available PET MPI agents. In addition, the maximum kinetic energy of positrons emitted during 82Rb decay is much higher than that of 13N and 18F . The latter aspect may have an impact on image quality: high-energy positrons have a long average distance to annihilation and, therefore, the spatial resolution is lower relative to other radionuclides with lower positron energies . The production of 15O-water PET depends on a cyclotron unit and it is seen as the gold standard for flow quantification, as it freely diffuses across the cardiomyocyte membrane and produces ideal flow measurements . However, its noisy low-count imaging quality as well as necessity of complex kinetic modeling limits its clinical use . 13N-ammonia is approved by the United States Food and Drug Administration and has a very good image quality, but it also requires a costly on-site cyclotron [18, 21]. 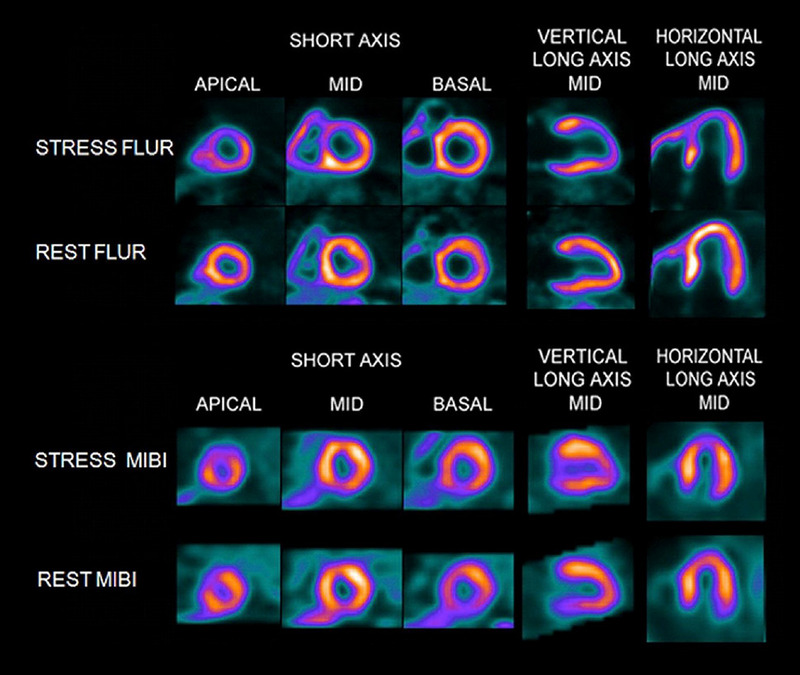 due to the short half-life of currently used PET MPI agents, stress imaging is only feasible while placing the patient under pharmacological stress. Notably, 18F-labeled radiotracers may overcome this limitation by allowing for physical exercise stress testing outside of the PET device [17, 25, 26]. To date, the most extensively studied 18F-labeled radiotracer for PET MPI is 18F-flurpiridaz (Fig. 1). 18F-flurpiridaz has demonstrated favorable imaging characteristics for MPI in preclinical studies: As a derivative of the pyridazinone insecticide pyridaben, it has a high binding affinity towards mitochondrial complex I, with a considerable high first-pass extraction of > 90% as measured in an isolated perfused heart setup [27, 28]. Comparing 18F-flurpiridaz with the established SPECT agent 99mTc sestamibi in a biodistribution rat study, the cardiac uptake of the 18F-labeled agent was significantly higher at both early (15 min) and late time points (120 min). This experiment was followed by an isolated rabbit heart perfusion study and net 18F-flurpiridaz cardiac uptake increased to a greater extent than that of 201TI or 99mTc sestamibi at physiologically relevant flow rates. Moreover, an in vivo PET study demonstrated almost no lung uptake and rapid liver clearance in rats, rabbits, and primates (pronounced washout between 5 and 15 min). In addition, a rat model of coronary occlusion also showed an excellent correlation with 18F-flurpiridaz uptake and histopathological findings . These findings were further corroborated in a chronic myocardial infarction (MI) model in rabbits (left coronary artery occlusion, followed by recovery phase over 1 month): compared to controls, a clear defect could be appreciated in the left ventricular wall. The promising safety profile of this imaging agent was further confirmed by electrocardiogram assessments in both controls and MI rabbits . Huisman et al. also used the Langendorff method and investigated the first-pass extraction of 18F-flurpiridaz in isolated perfused rat hearts, on which the radiotracer demonstrated a high and flow-independent myocardial first-pass extraction fraction. Thus, 18F-flurpiridaz may hold the promise of a linear correlation between radiotracer uptake and cardiac blood flow . Higuchi and coworkers tested 18F-flurpiridaz in rats in vivo. Normal healthy control rats were found to have a homogoneous delineation of the myocardium up to 2 h after tracer injection. However, for the permanent occlusion model, the defect size remained stable over the entire imaging protocol (15–115 min). This was in contradistinction to the transient ischemia model: reperfusion after short, transient ischemia of 3 min showed radiotracer redistribution to the induced defect (i.e. tracer redistribution after reperfusion). Radiotracer reinjection further enhanced the normalization process. The concept of redistribution is based on underperfused but viable myocardium, which retains the radiotracer while it washes out of normal myocardial areas, i.e. initial defects appear to normalize . The clinical application are diagnosis of CAD and most importantly, for the assessment of tissue viability, e.g. by radiotracer injection under physical stress with early and delayed imaging protocols, which allows to monitor such redistribution closely over time. Figure 2 shows the superior imaging characteristics of 18F-flurpiridaz PET compared to a common PET MPI agent, 13N-ammonia, in (A) healthy rats and (B) in a rat model after coronary artery occlusion. The 18F-labeled radiotracer demonstrated improved contrast and higher resolution, resulting in better delineation of induced lesions, despite a higher injected dose of 13N-ammonia relative to 18F-flurpiridaz. For the 18F-labeled imaging agent, the inferior/left ventricular wall can be better distinguished from the liver . Figure 3 displays a head-to-head comparison of 18F-flurpiridaz and 18F-FBnTP in a rat model of short-term occlusion and reperfusion. For the latter radiotracer, retention stability over time was confirmed, while 18F-flurpiridaz showed slow restoration over time. Differences may be explained by the underlying uptake mechanisms: 18F-flurpiridaz targets mitochondrial complex I, while 18F-FBnTP localizes to mitochondria due to membrane potential . The observed kinetics (redistribution after reperfusion) may allow for the use of 18F-flurpiridaz in a similar way to clinical protocols for the diagnosis of CAD with conventional stress/rest 201TI perfusion protocols or for the assessment of myocardial viability [32, 34]. In a permanent and transient occlusion model of the left coronary artery, uptake defect assessed by 18F-flurpiridaz closely correlated with histological measured scar sizes confirmed by 2,3,5-triphenyltetrazolium chloride staining . In a pig model, Guehl et al. demonstrated that accurate rest and stress blood flow estimations with 18F-flurpiridaz are feasible, even in less than 15 min of PET acquisition time by using a single-scan rest-stress method, which further emphasizes the practicality of this radiotracer in clinical routine . Also in a pig model, Sherif et al. showed that 18F-flurpiridaz retention and standardized uptake values (SUVs) correlated with absolute MBF values at rest and pharmacological stress. As such, SUVs may be used as a substitute for absolute blood flow. As SUV does not require determination of radiotracer input function, tracer injection and exercise treadmill or bicycle stress test protocols could be performed outside the scanner. From a practical standpoint, such an approach may facilitate flow estimation in clinical routine . By comparison with radioactive microsphere-derived blood flow in a pig model, a high agreement rate with regional MBF using 18F-flurpiridaz was achieved, even over a wide flow range . a Short-axis 18F-flurpiridaz PET in a healthy rat at 15, 45 and 115 min post-injection. The left ventricular myocardium showed excellent contrast to surrounding tissues. 13N-ammonia PET at 10 min in a coronal view. Regions of interest placements are displayed in white box. b Short-axis images of rat hearts 1 week after coronary artery occlusion using 18F-flurpiridaz and 13N-ammonia PET. The induced 18F-flurpiridaz uptake defect visualized at 15 min corresponded precisely to the defect in 13N-ammonia images. However, 18F-flurpiridaz demonstrated improved contrast and higher resolution resulting in better delineation of induced lesions, despite a higher injected dose of 13N-ammonia (57 MBq) versus 18F-flurpiridaz (37 MBq). The inferior/ left ventricular wall can be better distinguished from the liver due to a more rapid liver clearance of 18F-flurpiridaz compared to 13N-ammonia. Modified from Higuchi et al. © by the Society of Nuclear Medicine and Molecular Imaging, Inc. Head-to-head comparison of both 18F-labeled myocardial perfusion (MPI) PET radiotracers in a rat model of short-term occlusion and reperfusion. Radiotracers [18F-flurpiridaz and 18F-fluorobenzyltriphenyl-phosphonium (18F-FBnTP)] were injected during ischemia. 18F-flurpiridaz showed slow restoration of uptake, while 18F-FBnTP remained stable over time, i.e. stability and lack of washout was confirmed for 18F-FBnTP . Differences may be explained by different uptake mechanisms of both radiotracers . In a phase I trial enrolling healthy volunteers, a sustained retention was recorded up to 5 h post-injection and the radiotracer was well tolerated in all 13 subjects . Clear and homogenous delineation of the myocadium was appreciated up to 5 h after administration, while liver clearance was observed 2 h post-injection . Thus, the radiopharmaceutical is present in the myocardium to allow for an administration of the radiotracer at peak treadmill exercise. Moreover, kinetic studies demonstrated that imaging can be performed immediately after completing the exercise protocol and thus, 18F-flurpiridaz may identify even subtle stress-induced wall motion abnormalities (compared to SPECT with 99mTc agents, which generally involve imaging at least 30 min post-injection) . Apart from that, Packard et al. enrolled seven healthy subjects with a low likelihood of myocardial ischemia and 8 CAD patients using 18F-flurpiridaz. Notably, such a study design provided a wide range of MBF. In patients with no stress-inducible ischemia, no significant differences in MBF (either at rest or adenosine stress) and myocardial flow reserve (MFR) were recorded. This was in contradistinction to CAD subjects: lower MBF in diseased vascular segements after adenosine stress was noted and therefore, also a reduction in MFR . Berman et al. evaluated the efficacy and safety profile of 18F-flurpiridaz in a phase II trial. In 143 subjects from 21 different study sites, stress-rest PET and 99mTc sestamibi SPECT were performed, while the latter imaging modality served as a comparator. The certainty of interpretation, which was recorded by three blinded readers in a binary fashion (abnormal vs. normal), was considerably higher for PET (90.8% vs. SPECT, 70.9%). In 86 patients, who also underwent invasive coronary angiography (ICA, as a reference standard for coronary stenosis), PET revealed a higher sensitivity compared to SPECT, while specificity remained similar. Of note, in patients suffering from CAD (detected on invasive procedures), the magnitude of the reversible defect assessed with PET was larger than with SPECT. Figure 4 displays a mismatch of 18F-flurpiridaz PET MPI versus 99mTc-sestamibi SPECT MPI in an 82-year old male with an occluded native proximal left anterior descending (LAD) coronary artery and an occluded left internal mammary graft to the LAD. On 18F-flurpiridaz PET MPI, a reversible perfusion defect throughout the territory of the occluded proximal LAD was noted; the 99mTc-sestamibi images showed only a moderate perfusion defect in the distal LAD territory . Assessing the summed difference score for 18F-flurpiridaz MPI and 99mTc-sestamibi MPI, stress induced perfusion abnormalities in patients with multivessel CAD were significantly higher with PET MPI . Recently, Bateman et al. reported on 795 subjects from 72 international sites and described previous results of the first Phase III trial. The authors noted superior diagnostic performance characteristics for 18F-flurpiridaz relative to SPECT MPI for the assessment of CAD in obese patients . The recently launched, prospective, international, multi-center, open-label AURORA study (second Phase III study, ClinicalTrials.gov Identifier: NCT03354273) will include subjects with suspected CAD scheduled for ICA and both SPECT and PET MPI will be carried out prior to intervention. The primary endpoint is diagnostic efficacy of 18F-flurpiridaz PET MPI in detecting significant CAD [44, 45]. FLUR PET and MIBI SPECT images from an 82-year-old man. The FLUR PET (top) and MIBI SPECT (bottom) images from an 82-year-old man with shortness of breath and an occluded native proximal left anterior descending (LAD) coronary artery and an occluded left internal mammary graft to the LAD and no other significant native CAD. The FLUR images show a severe reversible perfusion defect throughout the territory of the occluded proximal LAD, whereas the MIBI images show only a moderate perfusion defect in the distal LAD territory (apical slices). FLUR = Flurpiridaz F 18; MIBI = Tc-99m sestamibi. The lipophilic cation 18F-FBnTP also accumulates in myocardial mitochondria . In mongrel dogs, uptake and retention kinetics were tested in vivo and 18F-FBnTP reached its plateau in the left ventricle 5 min after radiotracer administration. A delineation of the myocardium was still seen 90 min post-injection. In addition to that, the metabolite concentration in the blood was considerably low and the heart-to-liver ratio was 1.2 after 60 min. The heart-to-lung ratio was 12:1 (5 min post-injection), which was much higher than reported for 99mTc-labeled SPECT agents (2:1) in the same species. Thus, one may speculate that the lower background activity leads to better imaging contrast relative to SPECT counterparts [47, 48]. In addition, 18F-FBnTP was also compared to 99mTc-tetrofosmin SPECT in vivo by using various degrees of coronary artery stenosis: 17 dogs with different degrees of stenosis of LAD or circumflex coronary arteries were enrolled. Microsphere flow was assessed with radioactive micropsheres, which allow for distinction of true myocardial blood flow in ischemic versus non-ischemic beds of the left ventricle. Compared to 99mTc-tetrofosmin, superior diagnostic performance for 18F-FBnTP was reported, in particular for the assessment of mild or severe stenosis . To reveal further insights into kinetics of 18F-FBnTP, short transient coronary artery occlusion (ligation of the left coronary artery, 2 min) was induced in Wistar rats, which was followed by reperfusion. PET imaging with 18F-FBnTP showed that the radiotracer remained stable demonstrating no washout or redistribution and matched histologically proven defect areas . Recently, in a rat model of autoimmune myocarditis, the longitudinal imaging characteristics of 18F-FDG were investigated and 18F-FBnTP was used as a reference perfusion marker . Albeit this radiotracer is used in a preclinical setting over the last years, human data are still lacking and thus, if a more widespread adoption is envisaged, further clinical trials are warranted. In addition to 18F-FBnTP, 18F-labeled fluoroalkylphosphonium derivatives (18F-FATPs) have been synthesized as well: these are (5-18F-fluoropentyl)triphenylphosphonium cation (18F-FPTP), (6-18F-fluorohexyl)triphenylphosphonium cation (18F-FHTP), and (2-(2-18F-fluoroethoxy)ethyl)triphenylphosphonium cation (18F-FETP). Compared with 13N-ammonia in a rat model of coronary occlusion, 18F-FATPs showed excellent image quality, along with rapid liver and lung clearance . Table 1 summarizes key properties of 18F-labeled radiotracers for PET MPI. Supplementary Table 1 displays characteristics of established PET MPI agents and the novel PET agent 18F-flurpiridaz. 18F-labeled radiotracers allow for an improved target-to-background ratio compared to commonly used PET MPI agents, which in turn leads to higher imaging quality . Thus, given the superior imaging characteristics of 18F-labeled PET MPI radiotracers compared to other SPECT or PET MPI competitors, it is possible that these novel radiotracers further contribute to an even more tailored treatment approach for ischemic heart patients. Notably, the extraction fraction of those radiotracers at various flow rates open the door for optimal absolute MBF quantification . Cutoff values of both MBF and MFR could be established with those radiotracers and thus, could be used for risk stratification . This would apply to different subgroups in a clinical context which are at higher risk of cardiac events, such as diabetes or chronic kidney diseases . The latter group is of great interest, as cardiovascular disease is the main cause of death among patients suffering from severe renal dysfunction . However, conventional SPECT MPI cannot identify high-risk patients across a wide spectrum of renal (mal)function and thus, novel approaches using 18F PET MPI radiotracers may have an increased prognostic capability . In addition, quantification of MBF (assessed by 82Rb PET) in patients prior to heart transplantation can also identify subjects at high risk of suffering from later clinical events . 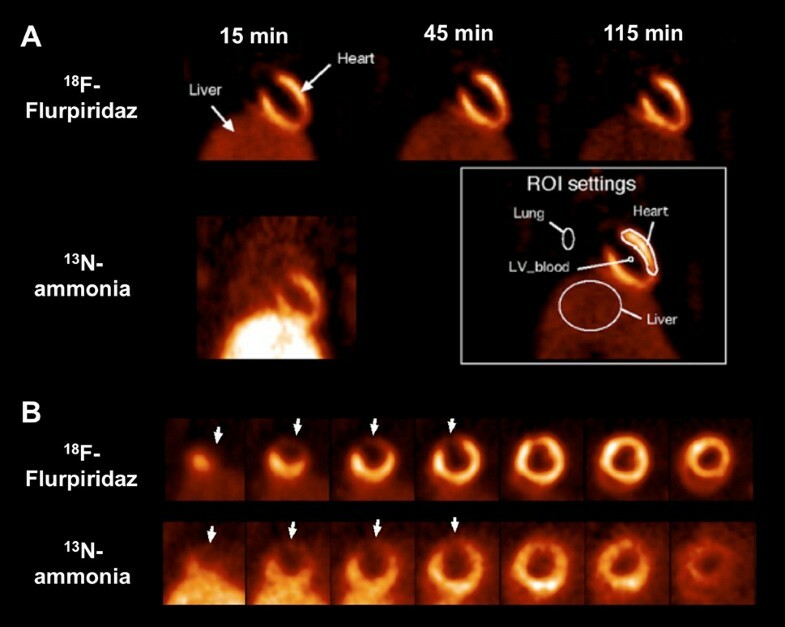 However, the longer half-life of 18F PET MPI along with their superior imaging quality may allow for a more practical adoption in clinical routine and a more thorough evaluation of the perfusion status in heart transplant recipients. Other applications of such radiotracers include chest pain with normal findings on coronary angiography . In a similar vein like for MPI PET agents, a recent shift from established cardiac neuronal PET agents (11C-hydroxyephedrine) towards novel 18F-labeled PET tracers to measure cardiac nerve integrity has been noted, e.g. by the use of the myocardial nerve imaging agent 18F-LMI1195 . Thus, in a dual-tracer approach, both newly introduced 18F radiotracers (18F-flurpiridaz for MBF and 18F-LMI1195 for cardiac nerve integrity) could be used. Such a global functional assessment of the heart has been also previously tested in a rat model of ischemia (with 11C-HED and 201TI for perfusion): compared to the perfusion defect areas, a larger 11C-HED uptake defect in both subacute and chronic phases was noted . Thus, further clinical applications, preferably with 18F-labeled cardiac perfusion/nerve tracers, which offer superior imaging quality, would be of great interest. 18F-labeled radionuclides for PET MPI perform well in assessing the defect size in CAD patients. First, they are less expensive to produce and may also be distributed using delivery systems from central cyclotron facilities . Second, the longer half-life of 18F-labeled MPI agents also allow for delayed imaging protocols, which in turn may allow for physical exercise stress testing protocols outside of the scanner . In light of its excellent extraction fraction, 18F-flurpiridaz has very favorable characteristics as a PET MPI agent and phase II/III trials have reported on a superior diagnostic performance relative to common SPECT MPI agents [39, 41, 43]. In the currently recruiting AURORA trial, subjects referred for ICA because of suspected CAD will undergo both SPECT and PET MPI prior to intervention [44, 45]. The results may reveal further insights into the efficacy of 18F-flurpiridaz PET MPI in detecting significant CAD. However, MPI (either with PET or SPECT) still remains underrepresented in some countries: for instance, in Germany, CAD diagnosis seems to be mainly shifted directly to invasive angiographic procedures, which in turn leads to less requests of such tests in clinical routine . This work was supported by the Competence Network of Heart Failure funded by the Integrated Research and Treatment Center (IFB) of the Federal Ministry of Education and Research (BMBF) and German Research Council (DFG Grant HI 1789/3-3 and CH 1516/2-1). This project has received funding from the European Union’s Horizon 2020 research and innovation programme under the Marie Sklodowska-Curie Grant Agreement No. 701983.